Cubii Jr is a 2017 model brand new desk elliptical trainer with a sturdy build and a number of user-friendly features. 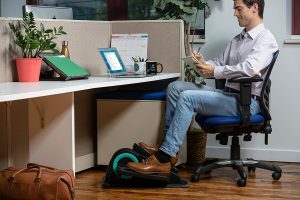 It is optimized and designed to fit under a standard desk very well and your knees will not bump under the desk, unlike some of the regular pedal exercisers. The reason the Cubii JR is called an elliptical trainer is that it mimics the movements of an elliptical rather than a regular bike. It includes an integrated easy to read LCD display panel that shows the calories, real time, distance, strides, and rpm. Thanks to its patented ergonomic handles the Cubii Jr offers a much lower impact workout that will be very easy on your joints, than the other standard exercise machines like treadmills or bikes. It is very well built but rather compact and easy to put together. Because there is not much to assemble and you will get the 4 screws you need and the instructions included in the box. It is designed for office use so you can expect it to be very quiet, runs quietly and smoothly and you will not be disturbing anyone or yourself in the office. And you can concentrate on your work better. You can choose from the eight resistance levels for different levels of workout intensity that you can adjust easily through the black and aqua tension dial in the middle. But please note that the resistance levels are a bit on the lighter side. It is for those of you without much time or extra effort to dedicate to regular exercise. You can use it while you’re working at the office, watching movies or shows at home, browsing the internet or listening to music. When you think about it, an average person would need to dedicate an average of two hours extra per day 4 to 5 days a week- to get to the gym, do a cardio session or an hour’s long class at the gym and get back home. And by owning a desk elliptical like Cubii you will be saving yourself at least 10 hours of time each week. So you can allocate that time to do the things you like- sleep, relax, spend it with your family or go out and have fun. You will be burning up to 85% more calories by using this desk trainer while sitting at your desk. Please, also not forget that for some unfit or overweight people gym environment can be kind of intimidating. And this may offer a good solution to work out more discreetly, burn some calories and weight. They can then perhaps get into a resistance training routine if they want to take it to a more advanced level. An average person will burn around 150 calories per hour. But this will vary according to the person’s weight and the level of resistance and rpm on the machine. It will also get your abdominal muscles involved and your posture. It will give you more energy, make you feel better both physically and mentally. Your legs and knees move higher with a desk bike and put extra pressure on your joints. With the Cubii Jr your legs will move so smoothly and without you even being aware while working and there will be no burden on your knees. The weight (more than 25 pounds) and dimensions of Cubii Jr prevent it from moving while you’re working out at your desk. And it comes with a carry handle as it may be hard to lift on your own. Two very small negatives we can think of are the possibility of sweating due to exercise in the office (but you’ll be fine if you keep the resistance lower) and the not so high resistance levels. Otherwise, this is a great value fitness product with a very solid and durable construction, super easy assembly, whisper quiet and smooth operation without squeaking or rattling.